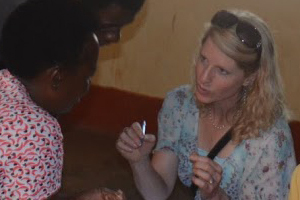 Health Studies Assistant Professor Kathleen Holton interviews research subjects in Kenya. Courtesy Kathleen Holton. Chronic pain is among the most vexing of health problems. It is linked to many illnesses and conditions, making it difficult to treat. For some, sensitivities to food additives play a role, and making a dietary change can help. Why does diet make a difference? The science is not well-understood. At American University, Kathleen Holton, assistant professor of health studies, explores how food additives contribute to people's pain. In her studies, Holton limits people's exposure to food additives and creates a new diet for them to assess if their pain diminishes or goes away. Holton published research on one of the most common food additives, glutamate, or what most consumers know as monosodium glutamate. The research, published in the journal Nutrition, shows a link between chronic pain and consumption of glutamate. When study participants cut MSG from their diets, their symptoms improved. Holton conducted the research in Meru, Kenya, with Dr. Peter K. Ndege, M.D., of Meru University of Science and Technology in Kenya, and University of Michigan Professor Dr. Daniel J. Clauw, M.D., a leading expert on chronic pain. "This preliminary research in Kenya is consistent with what I am observing in my chronic pain research here in the United States," said Holton. "We don't know what exposure is leading to this susceptibility to dietary glutamate, but this pilot study suggests the need for a large-scale clinical trial, since dietary change could be an effective low-cost treatment option for developing countries." Most research suggests that the prevalence of pain in the developing world is similar to the United States and other developed nations. Where diet is concerned, there are seemingly more similarities than ever before. MSG, a flavor enhancer, is found in Western and non-Western diets alike. Consumption of processed foods and fast food are global mainstays. While glutamate naturally occurs in some foods, like soy sauce and parmesan cheese, it is more commonly seen as a food additive. For consumers in the U.S., it can be challenging to keep track of food ingredients because of the number of additives approved for use here. In the U.S., glutamate is added to many food products and found under many names including 'monosodium glutamate,' 'hydrolyzed protein,' 'protein isolate,' 'protein extract' and 'autolyzed yeast extract,' just to name a few. As researchers study glutamate, they're gaining insights into how the chemical works in the human brain and body. In the nervous system, glutamate is a neurotransmitter, a chemical messenger that stimulates nerve cells and is essential to cell communication. But too much glutamate and the chemical can act as an excitotoxin, over-stimulating and damaging or killing nerve cells. In the U.S., excitotoxin exposure typically results from food additive consumption. Holton is trying to determine the effects of excitotoxins on neurological symptoms like headaches or migraines, chronic fatigue, cognitive dysfunction, and sleep issues. In Kenya, people's largest exposure to MSG is from a mixed seasoning spice called Mchuzi Mix, which is typically used in cooking daily. Holton created an alternative spice mix for the villagers who participated in the study. "I thought I'd get stopped going into the country. I had this suitcase full of bagged spices," she recalled. The goal was to test whether the dietary intervention – the alternative spice mix -- could perform as well as or better than over-the-counter medication in relieving pain. With a sample size of 30 participants, the researchers tested the effects of removing MSG, increasing water consumption, or a combination of both, relative to acetaminophen (the main treatment option available in Meru). The group that removed MSG from its diet and consumed more water reported significant improvements in their symptoms, as did the group receiving acetaminophen. In the future, Holton, Clauw and Ndege plan a larger, epidemiological survey to further probe widespread chronic pain in the region, which early data show to be much higher than average. They also plan to train Kenyan research staff and then conduct a large-scale clinical trial to test the efficacy of dietary change for pain in countries like Kenya. While carrying out the pilot study, Holton was struck by people's attitudes. "In Kenya, people liked that they could potentially benefit, but they loved the idea that this was being used to help the community," Holton said. "When I'd talk to them about the potential for the community benefit, they would light up." In the U.S., Holton is currently recruiting veterans for research on reducing glutamate in their diets. The goal is the same as in Kenya: to see if dietary change can be used to treat chronic widespread pain and other neurological symptoms. GWI is a multi-symptom illness occurring in veterans who fought in the Persian Gulf War of 1990-1991. Illness rates among those who were deployed vary from 21 percent for those serving on ships to 42 percent for those stationed in Iraq or Kuwait. The clinical trial is funded by the U.S. Department of Defense. The opioid epidemic has drastically changed how pain is being treated in this country, Holton said, and the novel idea of using dietary change for those suffering from multi-symptom illness, including chronic pain, could be a low-cost treatment strategy. As Clauw, Holton's colleague and University of Michigan professor and doctor, says, "This would be incredible if we could impact chronic pain simply by making slight modifications to diet."